Why buy when you can “own” for a fraction of the cost? Leasing is a great option for those who don’t want to deal with the hassles associated with buying a new car. It’s less money up front as well as simple monthly payments for the period that you own the car. If you’re in the market for a fresh new SUV but don’t want to pay the full price for a new one, we have an intriguing option for you. 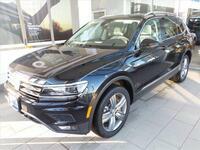 Get a 2018 Volkswagen Tiguan lease near Milwaukee WI today! What makes the Tiguan a popular choice among SUV shoppers? There are many reasons, but one of them would definitely be cargo space. The 2018 Tiguan received a massive upgrade in size; it now offers 30 percent more room than the 2017 model, upping the maximum cargo volume to 73.5 cubic feet. As it turns out, adding 10 inches of length goes a long way. Rear passengers can now enjoy more legroom than last year’s model as well as available third-row seats. Never count on an SUV to do a Tiguan’s job. German engineering does more than just contribute powerful performance. The 2018 Tiguan is jam-packed with technology in the way an SUV from 2018 should be. That means an available 12.3-inch digital display for an easy look at how your Tiguan is performing. Few automakers offer features like these, but there’s more: the high-resolution display can also flip to a wide map navigation view for turn-by-turn directions on the road without having to look away from your dashboard. Staying connected on the road is easy as well thanks to intelligent features like Apple CarPlay and Android Auto. These features allow you to connect your compatible smartphone to the 8-inch touch screen and access everything from the device, including apps, music playlists, messaging, and more. Aside from these are safety technologies designed to prevent a collision from occurring, such as Front Assist, Blind Spot Monitor, Overhead View Camera, Adaptive Cruise Control, and plenty of others. You may not always catch a glimpse of the dangers that await, but luckily the Tiguan will. Leasing the 2018 Tiguan could be the best decision you’ll make in 2018. With so much to offer drivers in terms of cargo space, performance, innovative technology and more, what are you waiting for? Contact us here at Hall Volkswagen in Brookfield today to see what we have in our inventory! Our talented team will help you find the Tiguan that fits your budget and then take care of all the pesky paperwork for you so that you can be on the road right away in your new SUV!